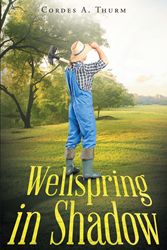 “Wellspring in Shadow” from Christian Faith Publishing author Cordes Thurm is an exciting read on being pro-life centered in the impact of an enigmatic gardener who has fascinated the people of Caruthersville and Elmwood with his mysterious personality. “Wellspring in Shadow”: a thrilling book that stresses the truth that God is pro-life. “Wellspring in Shadow” is the creation of published author, Cordes Thurm, a Christian who enjoys writing religious fiction and is currently working on another angelic novel. Thurm shares, “All this and more scorched her mind, and she leaned forward, draped her arms over the wheel, and buried her face. She fought the tears, which swelled her eyes, and finally scrubbed them on her coat sleeves. There was silence save for the gentle hum of the idling engine. What to do, Kathy Witt? You’ll look a fine prize now. You had better turn around and get this thing straight. Invite him over this evening or tomorrow or any time. Send Doreen away. Then my secret can be told. Then the thing will be revealed. Oh, why is it so hard? It shouldn’t be this way! It can’t be this way! The baby deserves better than this. You are pathetic, Kathy Witt! At least get your head up. Published by Christian Faith Publishing, Cordes Thurm’s new book is a revelation of the truth that God is pro-life, through the exchanges of the main characters; the life, death, and resurrection of Jesus Christ is the greatest evidence to claim this. Arthur Feldman and the other residents find themselves charmed by Jonathan, the gardener, as he helps the major characters in the story with their problems and leaps of faith. View a synopsis of “Wellspring in Shadow” on YouTube. Consumers can purchase“Wellspring in Shadow” at traditional brick & mortar bookstores, or online at Amazon.com, Apple iTunes store, Kobo or Barnes and Noble. For additional information or inquiries about “Wellspring in Shadow”, contact the Christian Faith Publishing media department at 866-554-0919.